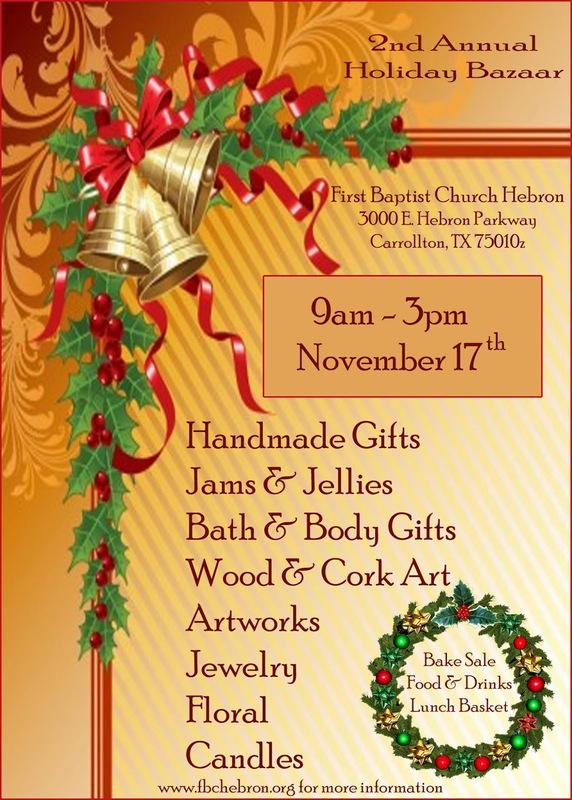 "Save the date and don't miss out on the 2nd annual, First Baptist Church Hebron, Craft Bazaar: Saturday, November 17, 2018. This is a great chance to purchase unusual Christmas gifts or treat yourself! Expect one-of-a-kind arts, crafts, creative retail, children's picture taken with book author, delicious baked sale items and numerous raffle opportunities. Please join us at First Baptist from 9 am - 3 pm to start your seasonal shopping. There will also by yummy food to purchase and historical tours of our Beautiful 100 Year Old Stained Glass Windows & Worship Center. See you there!" Applications are available here and are due by November 03, 2018. For more information, visit their website or contact their event coordinator at Marti5145@yahoo.com / Donna donnasmithtennis@sbcglobal.net / Becky admin@fbchebron.org.